The Holiday movie season, 2013 edition, has underwhelmed in a number of ways. This is in large part due to Hollywood avoiding it to some degree or not putting out their best product. Whether this is good strategy or not is best left to time travelers, but the reason for this arrives this weekend with what is likely to be the largest opening weekend of the year. The Hunger Games: Catching Fire may not technically be the only game in town this weekend, but it might as well be for all intents and purposes. The sequel to last year's adaptation of the first book in the Hunger Games trilogy (but movie quadrilogy, sigh), it has big shoes to fill. That was, if not a surprise in being a hit, perhaps a bit of a surprise in the scale of it, at a $150 million opening and $400 million domestic (and one of the few domestic hits that disappointed internationally, relative to those numbers). It stands out amongst a vast graveyard of recent attempted literary adaptations as studios cast about wildly trying to recreate the Harry Potter and/or Twilight phenomenon – and who would blame them? Billions in revenue from a pre-made franchise is nothing to sniff at. A brief recap if you've been in a coma: set in a post-apocalyptic dystopian (and there any post-apocalyptic uptopias?) North America, it posits a world in which a winner-take-all to-the-death competition among children from different regions is held in order to keep the lower classes in line after a long ago rebellion. The implied message: if you step out, we'll do this on a larger scale. 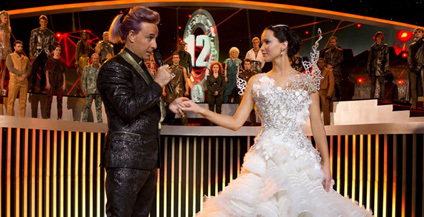 In Catching Fire, that stepping out starts to happen, and we get much more into the political implications of the events of the first fame. As the first co-winners of the Hunger Games, Katniss and Peeta's status makes them important ... and dangerous figures – flashpoints of a potential rebellion. In order to rid them and their influence, the Capitol region decides to make the next Games an all-star edition, bringing back all former winners – much in the same way that Donald Trump keeps bringing back Gary Busey.